(Nanowerk News) When lasers that could emit ultrashort pulses of light became available in the 1980s, Steve Leone recalls, they ushered in a new field of “femtochemistry.” A femtosecond is a quadrillionth of a second. The fastest motion known between atomic nuclei is about eight femtoseconds, the vibrational period between the two hydrogen atoms in a hydrogen molecule. Electrons bind, release, and move among the atoms in a molecule or crystal, but almost all of the atom’s mass is in its nucleus, which drags its electrons around with it. So a lot of chemistry can be done by watching atoms move, even when their electrons can’t be seen directly. But for Leone, femtoseconds don’t do the job. He wants to see electrons moving for themselves. These thoughts motivated the start of the attosecond science program at Berkeley in 2004, a collaborative effort led by Leone and his colleague in UC Berkeley’s Chemistry Department, Daniel Neumark, Director of Berkeley Lab’s Chemical Sciences Division. While there are more femtoseconds in a single second than there are seconds in 32 million years, attoseconds are a thousand times shorter yet – slices of time so fine that, while they can be counted and measured, they can hardly be imagined. In the time it takes a hydrogen molecule to make a single, vibratory bounce, its two electrons whiz around the molecule 300 times. Catching these electrons in the act requires subfemtosecond laser pulses, from hundreds down to just a few attoseconds. How is it possible to create pulses of light so short? The secret lies in the intimate relationships between photons and electrons. Photons give electrons energy; under certain conditions, the electrons can give back that energy and more. Imagine a red or near-infrared laser pulse (its long wavelengths are called “optical” wavelengths); the waves of the pulse’s electromagnetic field rise and fall like surf, and as it drives through a medium such as pressurized neon gas, the rising wave lifts electrons out of their orbits around atoms and accelerates them toward freedom. The intensity of the driver pulse isn’t always sufficient to permanently ionize the gas, however. Often, before the electrons can escape, the wave crests and reverses; the electrons are drawn back and reaccelerate into the atoms, carrying the extra energy they gained from the electromagnetic field. Upon recombination, the atom emits a burst of higher-frequency (ultraviolet or x-ray) light measured in attoseconds. As electrons continue to recombine, the process repeats with each half wave of the optical cycle, making a sequence of bright, high-frequency attosecond flashes, perfectly synchronized with the optical driver’s wave frequency, carrying them along in the same direction. This three-step process – electron acceleration away from the atom, acceleration back to the atom, and recombination that emits an attosecond flash – is called high harmonic generation. Long-wavelength laser light approaches an atom (left). The laser pulse ionizes the atom by boosting one of its electrons (center), but before it can escape, the light’s electric field reverses and forces the electron to recombine with the atom (right). The electron’s extra aquired energy is released as an attosecond burst of high-frequency x-rays (relative length of the pulse exaggerated for clarity). Leone’s group, in partnership with Neumark’s, is one of those, and they have achieved individual attosecond pulses in a new way. The most frequently used method for making attosecond pulses depends on filters that select the highest-frequency slice of the harmonic pulse, which rides along with the most energetic half-cycle wave in the carrier pulse envelope. But Leone and Neumark, with their students and postdocs, used a method called ionization gating. Ionization gating begins with a much more intense optical pulse – one so intense that the front of the pulse envelope knocks electrons right off the atoms in the gas, forming a dense plasma through which the pulse must plow. Not all the gas atoms are ionized, however; recombination of energized electrons and atoms still creates attosecond pulses of x-rays, but there’s a switch-like termination of the pulse train. The “switch” is a process called phase match gating. The attosecond pulses, produced on the leading edge of the optical pulse, are tunable in x-ray energy by adjusting the phase of the half cycles within the driver pulse envelope. The attosecond pulses need not be locked to the strongest half-cycle in the optical pulse envelope. Once the train has been terminated, the individual attosecond pulses, along with the original laser beam, continue on to a separate interaction region of the laser set-up, where experiments can be carried out. Once the attosecond pulses have entered the interaction region, Leone uses techniques called “carrier-envelope phase scanning” and “optical streaking” to observe what happens. 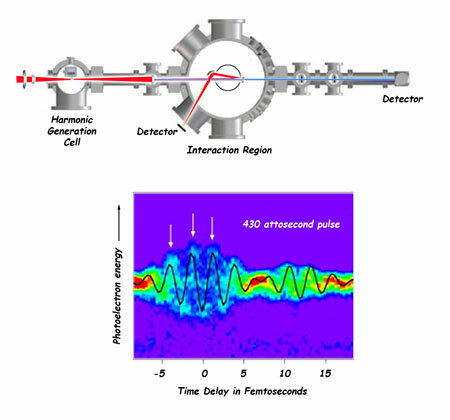 With these he can identify and characterize individual attosecond pulses. Carrier-envelope phase scanning: When an electron is boosted away from an atom during ionization, the photon that does the boosting consists of an electric field varying in one direction and then another. These fields can both add to and subtract from the electron’s momentum, so depending on when it is born, the photoelectron experiences a different force – sometimes stronger, sometimes weaker. Scanning the gas in the interaction region (whatever gas is the subject of the experiment) allows the timing of the electrons produced by the attosecond bursts to be identified by their extra momentum. Optical streaking: A subsequent streak spectrogram compares the energy of the attosecond pulse to the energy of the photoelectron, as the two change over time. The streak spectrogram confirms the existence of individual attosecond pulses, measures their length, and determines when a secondary electron is produced. A red laser produces attosecond pulses of x-rays by harmonic generation. Optical light and x-rays travel together into the interaction region, then are separated by a mirror and recorded by detectors. Photoelectrons generated by the attosecond pulses in the interaction region are analyzed by a time-of-flight detector (circle). The streaked photoelectron spectrum, shown versus the laser pulse delay time, reveals the duration of the x-ray pulse to be about 430 attoseconds. Even with this oversensitive instrument, Leone’s group has done unique scientific experiments on gas-phase samples. Using attosecond x-rays as pump pulses to ionize a thin gas of sulfur hexafluoride (SF6), they follow up with precisely timed probe pulses from the longer-wavelength, femtosecond laser beam, using ionization spectroscopy to see what happens as the molecules “evolve” – that is, as the sulfur compounds fall apart in an ordered routine dictated by nature. Knowing how nature does it could lead to control of such complex processes. Practically next door to Leone’s lab in Building 2, Robert Kaindl of the Materials Sciences Division also uses an attosecond laser, disentangling electronic correlations in nanoparticles and complex materials. Meanwhile, Leone and Neumark pursue solid state physics at another lab on the UC Berkeley campus, studying such phenomena as excitons (the bound states of negatively charged electrons with positively charged holes). This work is vital to developing better solar cells, since excitons are important precursors to the separation of charges in semiconductors for converting sunlight to electrical current. The science is so promising that other attosecond laser systems are already in the works. In January the W. M. Keck Foundation awarded $1 million to Leone and Neumark to upgrade a campus laboratory for attosecond science. Shortly thereafter the Department of Defense awarded Leone a National Security Science and Engineering Faculty Fellowship amounting to $850,000 per year over five years. “The Keck grant will go for equipment and the DOD award will fund operations, supplementing the generous support from the Department of Energy,” he says. Already on the horizon are powerful light sources able to generate ultrabright attosecond pulses of x-rays up to a million times a second, using some combination of linear accelerators, advanced electron injectors, and free electron lasers (FELs). When he was with Berkeley Lab’s Accelerator and Fusion Research Division, Sasha Zholents (who is now at Argonne’s Advanced Photon Source) devised a laser pulse-slicing scheme using wiggler magnets, now used by the Advanced Light Source to produce femtosecond x-ray beams. He also pioneered a similar concept to produce attosecond pulses. The Zholents schemes “were the precursors to attosecond hopes for FELs,” Leone says. High intensity, FEL-produced attosecond pulses, which may be made by such machines as Berkeley Lab’s proposed Next Generation Light Source, will be crucial to using attosecond pulses for both pump pulses and (until now impractical) probe pulses as well. Only in this way will it become possible to create and control the states of matter and chemical processes that theorists can visualize and model with computers.